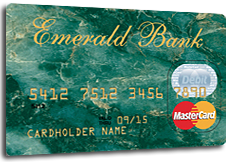 Take Advantage of the Emerald Bank Debit Card. Your Emerald Bank debit card offers you the convenience of checking plus the added value of safety, easy record keeping and affordability. Your debit card can be used at millions of establishments and ATMs around the world. It is faster and easier than writing checks, have access to cash throughout the United States and around the world, make withdrawals, transfers, inquiries and deposits (where allowed) at ATM terminals, get cash back at participating merchants when using PIN debit, save on the cost or ordering checks and each transaction appears on your monthly statement. You should immediately notify Emerald Bank of any loss, theft, disappearance or known suspected unauthorized use of your debit card. Please call Emerald Bank at 620-438-2212 or 620-455-3326 during normal business hours or call Shazam at 800-383-8000 after hours. Emerald Bank is a participating Privileged Status financial institution. You can use the ATMs of other participating Privileged Status financial institutions without paying surcharge fees. Look for the Privileged Status logo shown below. You can search for a Privileged Status ATM in a specific area using the Privileged Status ATM Locator. Click to search for a Privileged Status ATM. Memorize your PIN. Don 't write it on your card or anything you carry near your card. Don 't expose the magnetic stripe to other magnetic objects, which can deactivate your card. Record and file the name and phone numbers of your card's issuer for reporting loss or theft. If you are headed out of town, give us a quick call to let us know. One of the ways we protect you is to block suspicious transactions, including unexpected out-of-town purchases. Your call will save you the inconvenience of having your card declined. Clean out your wallet. Carrying a lot of credit and debit cards on vacation only increases the likelihood that one of them will become lost or stolen. Take only what you need, and make sure your limits are high enough to cover all expenses. Extra tip: Find out your daily withdrawal limit before you leave and ask to have it increased while on your trip. Always be mindful of your personal security when accessing an ATM. Put your money and your card away immediately after making a withdrawal. Count your money later, out of public view. Extra tip: If you can’t find an ATM and need cash, ask for cash back when you use your debit card for purchases at retail locations. Put your receipts in your pocket — not the bag. It’s common to end up with a lot of receipts when traveling. Even though receipts don't typically display full account numbers, a thief can still do a lot with the information. Crooks can also use receipts to make fraudulent returns linked to you. Monitor your account frequently. Checking your account balance is a great way to combat fraud. With the new SHAZAM BOLT$ mobile app, you can receive alerts to potential fraud on your smartphone or tablet and check your debit account balances as often as you'd like. Report a lost or stolen card immediately. Be sure to contact us for our emergency travel phone numbers before your trip and keep them in a safe place.